Two CMU PhD students, Mansur Arief and Jiacheng Zhu, from Mechanical Engineering ME presented at the ITSC conference. UTC Professor, Ding Zhao and his group published 6 papers in this conference, which is considered to the top conference in the autonomous vehicles field. 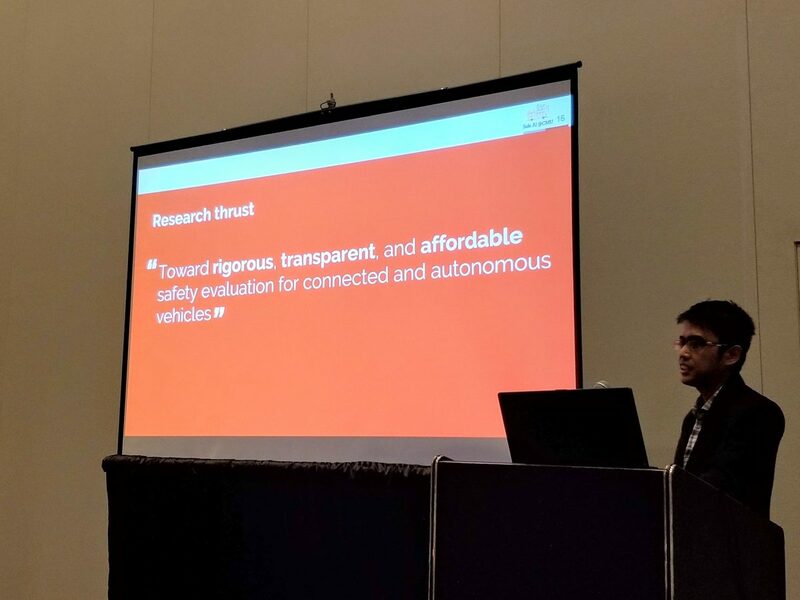 Mansur Arief, Peter Glynn, Ding Zhao, ”An Accelerated Approach to Safely and Efficiently Test Pre-production Autonomous Vehicles on Public Streets,” Proceedings of the IEEE 20th International Intelligent Transportation Systems Conference (ITSC), Hawaii, USA, November 4-7, 2018. Jiacheng Zhu, Wenshuo Wang, Ding Zhao, ”A Tempt to Unify Heterogeneous Driving Databases using Traffic Primitives,” Proceedings of the IEEE 20th International Intelligent Transportation Systems Conference (ITSC), Hawaii, USA, November 4-7, 2018. Xun Gong, Yaohui Guo, Yiheng Feng, Jing Sun, Ding Zhao, ”Evaluation of the Energy Efficiency in a Mixed Traffic with Automated Vehicles and Human Controlled Vehicles,” Proceedings of the IEEE 20th International Intelligent Transportation Systems Conference (ITSC), Hawaii, USA, November 4-7, 2018. Zhiyuan Huang, Mansur Arief, Henry Lam, Ding Zhao, ”Synthesis of Different Autonomous Vehicles Test Approaches,” Proceedings of the IEEE 20th International Intelligent Transportation Systems Conference (ITSC), Hawaii, USA, November 4-7, 2018. Yan Chang, Weiqing Yang, Ding Zhao, ”Fuel Economy and Emission Testing for Connected and Automated Vehicles Using Real-world Driving Datasets,” Proceedings of the IEEE 20th International Intelligent Transportation Systems Conference (ITSC), Hawaii, USA, November 4-7, 2018. Songan Zhang, Huei Peng, Eric Tseng, Ding Zhao, “Accelerated Evaluation of Autonomous Vehicles in the Lane Change Scenario Based on Subset Simulation Technique,” Proceedings of the IEEE 20th International Intelligent Transportation Systems Conference (ITSC), Hawaii, USA, November 4-7, 2018.